Take the Music with You Wherever You Go... Get iFox - Then prepare to WOW and be WOW'd! Want to make sure your tunes are at your fingertips... but don't want to lug around oversized, bulky speakers? Then the iFox is the answer for you. We've carefully engineered the iFox Bluetooth Speaker to deliver jaw-dropping sound... with easily adjustable volume. In fact, you'll be amazed at the impressively loud, exceptionally clear sound from this fully-loaded speaker. You get NFC and Wireless Bluetooth streaming from all of your devices... and, of course, you can always connect your device via a 3.5mm jack. Why Do People LOVE the iFOX? Compact Size - With a sleek design that fits in your bag, backpack or jacket pocket! Whether you're at home, on the road, at school, on a camping trip or backyard BBQ... you'll always have your tunes! Rich, Loud Sound - This speaker is built for sound! This 6 watt, 2 channel stereo speaker delivers the clarity and volume you need to not just listen to music... but to truly feel it! Long Battery Life and Fast Charging - iFox's 2000mAh battery allows you to enjoy up to 10 hours of music per charge. And when it's time to power up, connect the charger, and your speaker will be ready in just 2-3 hours! Impressive Range - With iFox, you can wander up to 33 feet away and still keep the tunes alive! Protected with Our 1-Year Money-Back Guarantee! Get Your Hands on Your iFox Today! Don't take our word for it - discover the iFox for yourself risk-free! Order today... and while you're at it, pick up a couple to give as gifts! ��MAKE A GREAT IMPRESSION! - The iFS309 is the ideal gift for anyone who loves to enjoy their music anytime, anywhere! 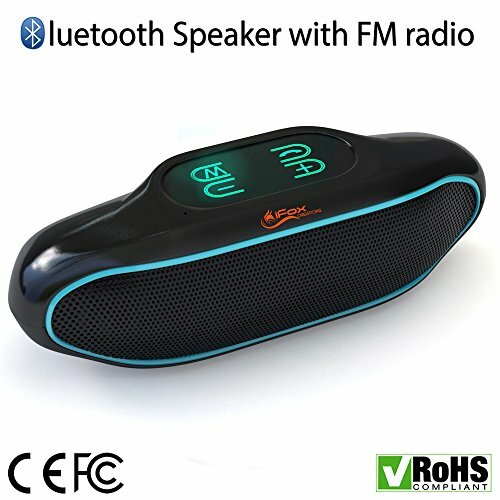 Your speaker connects effortlessly, looks great and is equally effective for easy listening or cranking the party up! View More In Portable Speakers & Audio Docks. If you have any questions about this product by ifoxcreations, contact us by completing and submitting the form below. If you are looking for a specif part number, please include it with your message.